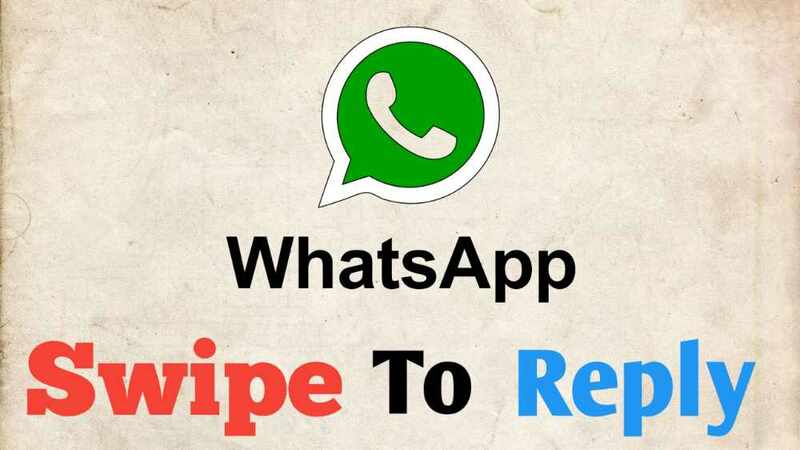 Now Whatsapp Was Released New Features It's Called Whatsapp 'Swipe To Reply feature' This New Features Was Releted To A Any Message Reply On Whatsapp. Now You Can Select Message Faster To Give Reply In The Chat With This Whatsapp Swipe to reply feature So Let's know More Information About This whatsapp's new Swipe to reply feature or know Its Work. Actually Its Feature Of iPhone But Now Whatsapp was Launched This Features For Android User's. this Whatsapp Swipe To Reply Feature was Available On Whatsapp Version 2.18.300 You Can Use Simple Swipe Gestures to Instant Reply To a Message. Its New Whatsapp Features 2018 For Android User's And Also One More New Whatsapp Picture In Picture Feature was Released. So Now Let's Know How This Feature Work. How Whatsapp Swipe To Reply Feature Work ? Now If You Want To Send Any Message Reply On Whatsapp Then Just Swipe On Message And you Be Easliy Give Reply. It's Very Easy To Use. If You Not Understand Then Chack This Video And Seen a Demo Of Whatsapp Swipe To Reply feature. How To Enable whatsapp Swipe To Reply Feature ? You Need To Enable whatsapp Swipe to reply feature then Update Your whatsapp With Version 2.18.300. After Updating Your Feature was Enable And You Can Enjoy This Feature. If This Feature Not Working So You Can Also Download Apk Of Whatsapp 2.18.300 And Enable This Feature. Finally I Hope You Will Like This Information About The Whatsapp Swipe To reply feature So Must Share With All Your whatsapp Friends. also Comment Any Questions Releted To This Or Say Do You Like This Whatsapp New Features Or Not. 0 Response to "Whatsapp 'Swipe To Reply' Feature For Android Users Here's How This Feature Work"